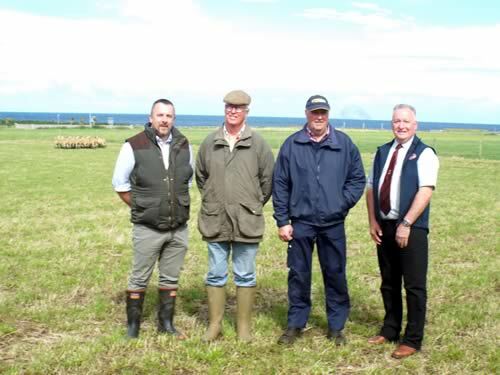 An Ayrshire farm offering spectacular views towards Ailsa Craig, Arran, Mull of Kintyre and Northern Ireland is set to host Scotland’s national sheep event, NSA Scotsheep, next year. Organised by the Scottish region of the National Sheep Association, NSA Scotsheep 2018 will be held on May 30, 2018, at Kings Arms Farm, Ballantrae, where Robert and Caroline Dalrymple, along with long-time farm manager, Andrew Maclean, run a flock of 1400 ewes with all lambs finished on the farm. NSA Scotland chairman, John Fyall, host farmer, Robert Dalrymple, farm manager, Andrew Maclean, and organising committee chairman, George Allan. “Kings Arms Farm is an excellent venue for NSA Scotsheep 2018 and we are grateful to Mr and Mrs Dalrymple and their staff for kindly agreeing to host what is always the major event for the sheep industry in Scotland,” said NSA Scotland chairman, John Fyall. Mr Dalrymple said he was delighted and honoured to be asked to host such an important event for the sheep industry in Scotland and looked forward to welcoming fellow sheep farmers to Kings Arms Farm. “We are lucky to be in an area where we can grow grass and we try to make the best use of it. The farm is all-grass and all our lambs are finished on grass,” said Mr Dalrymple. The farm is situated in the village of Ballantrae 34 miles south of Ayr and 17 miles north of Stranraer on the A77 trunk road. The farming enterprise extends to a total of 350 acres at Kings Arms Farm, 350 acres at Crailoch three miles away and a further 250 acres rented two miles away. The sheep flock of 1400 ewes comprises 1000 Texel x Mule ewes which are firstly put to the Suffolk ram for the potential creep feeding of early lambs, followed by Texel and Beltex, and 400 Scotch Mules which are put to Texel rams to produce replacement Texel cross ewe lambs. Ewes are lambed from mid-February and lambs marketed from mid-May onwards through Farmstock Scotland to Woodhead Bros, Turriff, for Morrisons. In the two years 2012 and 2013, the flock was one of three selected for the QMS Better Breeding project to demonstrate the benefits of using performance-recorded Suffolk rams. The results of the trial indicated that high index rams consistently outperformed rams selected in the traditional manner by £5 per ewe mated per year. The farm also supports a suckler herd of 185 Limousin and Aberdeen-Angus cross Friesian cows which are crossed with home-bred Charolais bulls from the farm’s 15-cow Charolais herd. Organisation of the event will be in the hands of a local committee chaired by George Allan, who is a well-known exhibitor of Scotch Mules at the summer shows and secretary of the Scotch Mule Association. He is also an animal health sales representative with Carrs Billington and a long-standing member of the NSA Scotland committee.